Frances Cabrini. This Italian sister learned the secret way of uniting with God to powerfully love and serve suffering souls, founding 67 charitable institutions. Therese Neumann, joyful German stigmatic/visionary miracle-worker, she transformed her pain into a means of helping and healing others in a Christ-filled life. Pelagia the “Holy Fool,” a Russian woman of immense sanctity. God led her into shockingly strange forms of behavior and heavenly dimensions of being. Maria Skobtsova. A Russian émigré to Paris, she ministered to the poor and saved a multitude of souls from the Nazi horror before willingly going to her death in one of the camps as an inspiration to her suffering friends. Hazrat Babajan. This Afghani princess fled an arranged marriage and went deep into the wilds of nature and the loving heart of Allah to become one of the most powerful Muslim Sufi saints of all time—and lived allegedly some 125 years. Anandamayi Ma, the Bliss-filled Mother. She was India’s “Guru to the gurus” and delightful spiritual empress over most of this century—a profoundly witty sage. Anasuya Devi, another obvious Divine Incarnation, completely aware from her birth. She raised a family and then became known as “Mother of all,” giving a startling teaching on “original innocence,” claiming that God alone does all. Shyama Mataji. This young wife lovingly began chanting to God for 23 hours every day, soon becoming a miracle-worker extraordinaire, a beautiful singer of the glories of the Lord, and a passionate poetess-saint of the highest order. Mata Amritanandamayi. Ammachi has courageously emerged against all obstacles as a marvelous Incarnation of Divine Mother-Love. World Teacher and Christ-like Savioress, she has transformed millions of hearts with healing Love. 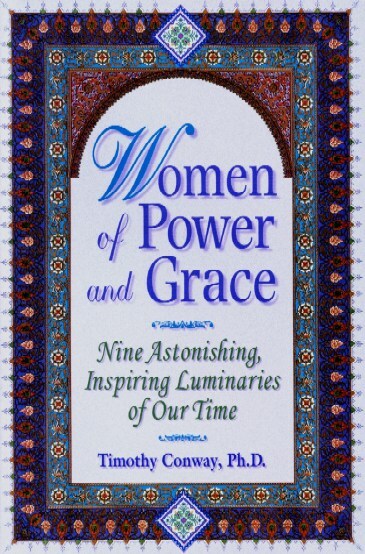 “I absolutely love Women of Power and Grace. I was enthralled. The quality of your work is outstanding.” -- Linda Johnsen, author: Daughters of the Goddess, The Living Goddess, Fearless Living, Lost Masters: Sages of Ancient Greece, etc. “Timothy, I'm reading your book now and I have to tell you it's WONDERFUL. Your writing style is so very accessible, and addresses any and all 'doubts' and questions that the reader might have. And the experiences are framed so beautifully and tenderly. It's clear that this is a work of divine inspiration and love. I'm quite inspired and moved by the stories. You are a wonderful writer and I feel that this book should be required reading in all public schools! It truly awakens the reader to the Divine, as well as to the Divine Feminine. It's a 'must read' for anyone on the spiritual path.” --Lance White, aka Zany Mystic, host of A Fireside Chat internet “radio” show at www.bbsradio.com.